In the early 1990s, the railway station in Poznań, Poland was still a “steamy” place. 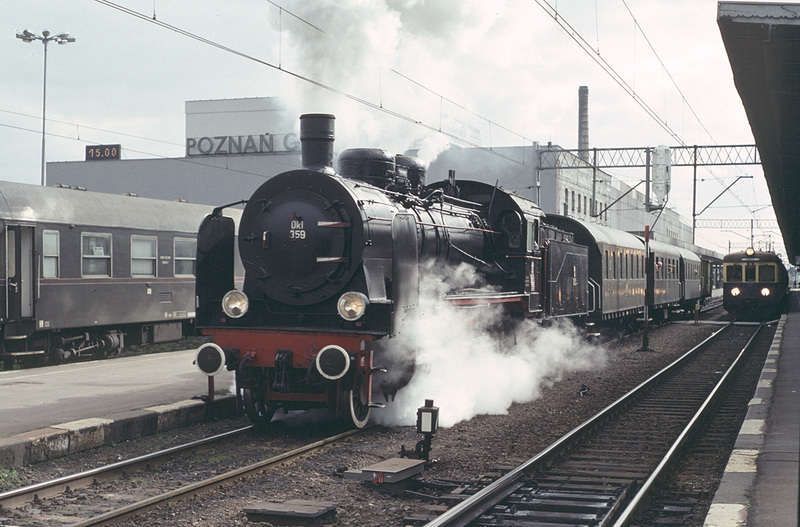 Several regular-service, steam-hauled passenger trains operated daily from Poznań to the regional town of Wolsztyn. Steam locomotives on layover in Poznań would visit the local roundhouse for water and sometimes turning. On 19 September, PKP Ok1-359 was found on a charter/special train at the Poznań Główny station. 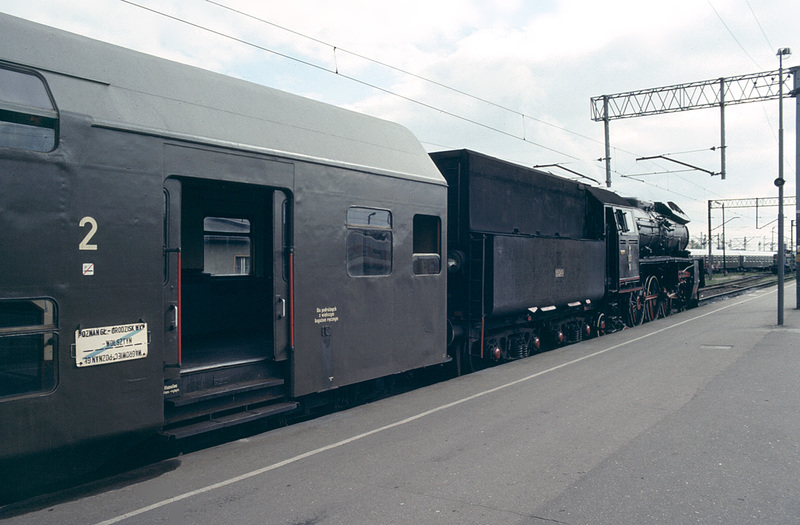 The Ok1 is a former Prussian railways P38-class, built in Berlin in 1917. In recent years the locomotive has been out of service, stored at Wolsztyn awaiting repairs. Also note the post office car to to left of the locomotive. With the slow disappearance of overnight trains and rising costs, the postal cars often attached to them were withdrawn through the 2000s, with the last postal car (ambulans pocztowy in Polish) running in 2011. Ok1-359 on a charter train at Poznań Główny station in Poznań, Poland on 19 September 1993. On 19 September 1993, Ol49-32 waited at the platform with a local all-stops train to Wolsztyn. 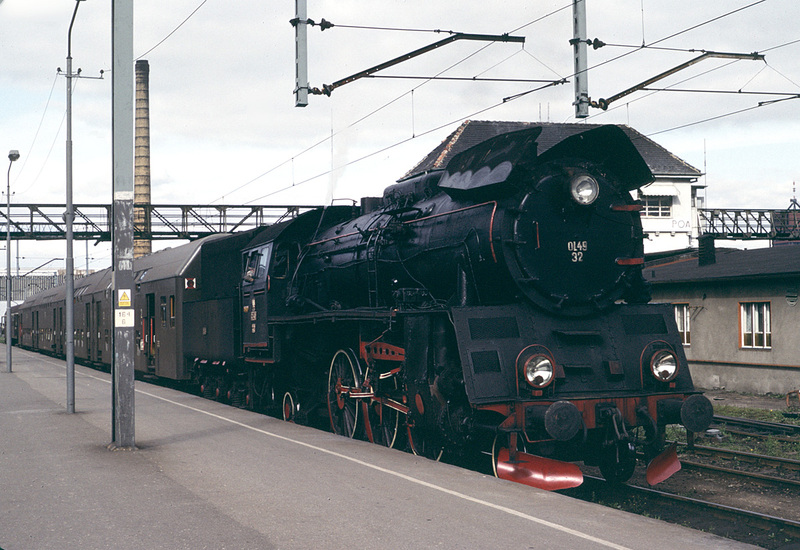 This locomotive was retired in the year 2000, and later used as a parts supply. It was scrapped at Gniezno in 2002. Ol49-32 waits at Poznań Główny station at the head of a train to Wolsztyn, Poland on 19 September 1993. Here is the “going-away” photo of the same train. The double-deck “Bhp” carriages, which were so typical of Polish local trains, have all but disappeared today.